The unassuming and labyrinth Irish countryside provides the setting for In Fear, a distressing micro-budget horror from first time writer and director Jeremy Lovering that’s sadly let down by an ending that works against what’s been built up over the course of the rest of the film. Unlike other films of its ilk, In Fear’s success boils down to its ability to instil genuine dread through its cramped and unfamiliar environment, rather than using quick, gimmicky shocks for effective, yet quick and hit-or-miss scares. En route to meet friends at a weekend-long rock festival in Ireland, Tom (Iain De Caestecker) invites new girlfriend Lucy (Alice Englert) to spend a romantic evening with him at a remote hotel in the depths of rural Ireland. Hesitant at first, Lucy soon warms to Tom’s romantic offer. However, as the directions send them further and further off the beaten track, Tom and Lucy soon realise that all is not as it seems, and they’re soon left fighting not only for their newfound relationship, but also for their lives. Clocking in at a brisk 85 minutes, In Fear is a solidly taut and claustrophobic horror-thriller. Writer and director Jeremy Lovering wastes little time in introducing our protagonists (a basic setup simply informs us that Tom is cheeky, but compassionate, while Lucy is the more quiet and reserved type, but leaves other details to the imagination) before sending them deeper and deeper into the woodlands on a game of cat-and-mouse that not only tests their courage and their nerves, but also their newfangled relationship. What unspools is – for the vast majority, at least – a triumph in innate terror. According to various reports, Lovering withheld the script from both leads, only serving them the very basics – and what’s come of it is an altogether more realistic and unnerving film. Like the audience, Tom and Lucy are blind, unaware of the terror that awaits them around every curve in the road. This coupled with the claustrophobia of the setting (a countryside has never been used so effectively), Daniel Pemberton and Roly Porter’s score and the intruding darkness ups the ante even further. It’s a shame, then, that the film stumbles so frustratingly in its third act. The intense focus on Tom and Lucy, and more importantly how their escalating nerves from the bumps and jolts and enveloping nightmare drive them to different reactions and extremes, is so well done and so refreshing within a modern horror film that once a third character is introduced, in the form of the mysteriously battered and bruised Max (Allen Leech), that intensity is lost, and the remainder of the film feels entirely different to what’s come before. 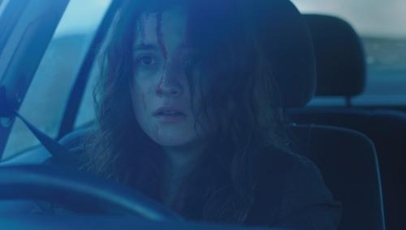 But because of what Lovering and his two talented cast members (Caestecker and Englert are both superb in conveying their panic and irritations) achieve in the first hour, In Fear is still, even with the dramatic loss of tension and atmosphere towards the end, an unnerving and well executed modern low-fi horror film. It’s not game changing, but there’s a lot to admire here regardless, not least for two understandings that clearly emerge: That Lovering is destined for a big, lasting career, and that rural retreats should only be done as long as detailed research is done beforehand.